There are no real Royal Rife generators commonly available for sale. Function generators, EMEMs, and Rife-Bare devices are not really Rife devices, even though they may be advertised as such. Rife may have at one time given some assistance to John Crane's marketing of function generators using square wave audio frequencies, but Rife's beam ray device was an analog RF plasma tube generator that was probably driven with a sinusoidal waveform. The Rife-Bare device was invented by James Bare after studying Royal Rife's work. Bare's Rife generator may produce some of the same beneficial effects of the original Rife device using modern electronic components. It may or may not be as effective as the original. It uses audio frequencies like many bioelectronic devices do, but instead of just holding onto the outputs of a function generator or other pad device, the audio frequencies are combined with a radio frequency (RF) carrier signal, amplified, then output to a "plasma tube" which is a sealed glass tube usually filled with mostly argon and some neon gas. This tube emits "the ray beam" and, unlike with plasma tube devices that do not use an RF carrier such as EMEM devices, it should not be touched more than briefly since it may cause RF burns. A Biography of Royal Rife is a short article on the life of Royal Raymond Rife and discusses some of his research, accomplishments, then persecution. See also the Morris Fishbein article below. Rife Bare Tech Notes contains mostly construction notes for those building their own device, but also information on operation, theory, and troubleshooting plus some articles and compilations useful for those with commercial devices like Is Your Rife-Bare Working? and Operating Notes. Morris Fishbein was head of the AMA and editor for JAMA in the early to mid 1900's and probably the person most responsible for Rife's persecution. This article from LewRockwell.com explains some of the effects his reign had on the US medical industry and in particular the use of Rife's devices. 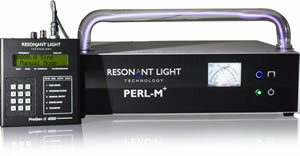 The Resonant Light PERL (on left) is a professional Rife-Bare device. James Bare designed and holds the patent on the Rife-Bare device and is the primary researcher in this field. His construction manual is offered for sale on this page. Bare also owns the Plasma Sonics company which sells components for constructing a Rife-Bare device oneself. Resonant Light Technology is the oldest manufacturer of professionally-built Rife-Bare units. They feature the Phorle model PERL which was rated as a Class II medical device in Canada. Resonant Light is an ISO certified company. Don Tunney is the owner and president. Vibrant Health specializes in building high-powered, high frequency Rife-Bare devices, the latest model being the IR/BPT-500. David Trebing is the owner and president of Vibrant Health. Barry Lynes wrote "The Cancer Cure that Worked" which is a book describing the history and politics of Rife's plasma tube generator.Barry Lyne's website was down for years and no one appears to have any news on him, but Bryan Rosner of the BioMed Publishing Group led the effort to get the book back in print. The Rise and Fall of a Scientific Genius is a documentary video made by Shawn Montgomery detailing "The Forgotten Story of Royal Raymond Rife." Peter Walker hosts the Rife Europe site which contains many historical and research Rife papers and also conducts the Rife Forum. Tom Bearden has written articles on electrical effects on organisms and other matter, furthered Prior's work, and includes the full text of his patent titled "Method, System and Apparatus for Conditioning Electromagnetic Potentials, Fields, and Waves to Treat and Alter Matter" plus a lengthy article called "Novel Principles In The Rife Microscope And Rife's Great Secret"
Ralph Hartwell participated in some of the research in the early days (early to mid 1990's) of the Rife-Bare device. Ralph is an RF engineer and gives useful info on the RF aspects of rifing, as well as info on Tesla devices. His company, Rife-Beam-Ray sells controller boards, couplers, amplifiers, plasma tube electrodes, and other components for the DIY Rifer. Stone Circle Alternatives has information on many complementary health modalities plus Rife Research info including the very useful "Cross Reference of Rife Frequencies" plus detailed reports on fighting some viruses including retrovirus with a Rife Bare. Bill Cheb builds tubes for rife devices including the Phanotron and ones made of Pyrex and quartz. DFE Research Network has information on Rife-Bare research and complementary health and nutrition plus info on DIY rife, an excellent list of links to suppliers of Rife components, and microscope information. We've been working on this issue in our lab recently (responding here to comments from Jason Ringas). After consultation with several biologists and cooperation with an expert microbiologist, E. Coli was not advised as the best first bacteria to work with. One does need to consult the ATCC website to determine the biosafety level of your bacteria, making sure your organism is a biosafety level 1 ('harmless'). Some biological supply houses will send certain strains of 'harmless' bacteria to your home/office, but some require that your organization be licensed to receive certain organisms, even biosafety level 1 organisms, of this I am sure. Even with 'harmless' bacteria, there are procedures that have to be followed in the lab which involve autoclaving, sterilization of innoculation loops, preparation of sterile nutrient solutions, sterile pipettes,sterile agar plates, 30 deg C. incubators, refrigeration, etc. A fair amount of things need to be collected before you can even start work with even 'harmless' bacteria. One needs to shop around a bit but the resources can be had, if you can get access to a decent microscope. As a standard test set-up, I would recommend that commercially available non pathogenic E. Coli be used; the type that students use. E. Coli is an ideal organism to demonstrate the Rife effect because it is a motile organism, and will be visibly affected when hit with its MOR. That's why Rife used it in his demonstrations. If all the Rife researchers focused on this and followed a standardized protocol, we would get this sorted out that much sooner.